So you’ve heard that bone broth can support digestive health, or boost the immune system or make for flawless skin. While bone broth is anything but new, it has certainly skyrocketed in popularity in the last ten years. Bone broth is a savory elixir with elusive umami notes owing to its high protein content and long, slow cooking time. While a good bone broth is both easy and cheap to make on its own at home, it’s also time-intensive, and definitely a labor of love. You’ll need big enough stock pot and plenty of time to source good-quality grass-fed beef or pasture-raised chicken bones, lovingly roast them and then simmer them on the stove for upwards of a day. Not everyone can (or wants to) devote a day to tending a pot of simmering bones. But, fortunately for you, there’s plenty packaged, store-bought bone broth brands that are almost as good as homemade. So here’s our take on what to look for when buying bone broth, how to find the best brands and how to skip the imposters. What’s the Best Bone Broth? Far and away, our testers at Nourished Kitchen found that homemade bone broth consistently tastes better than any store bought brand. 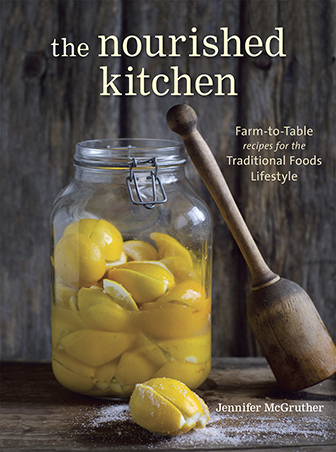 If you’re game to give it a go, you can get some great recipes in this cookbook. It’s not surprising that homemade broths outrank store-bought, since they’re carefully tended one stock pot at a time, and you can make tiny adjustments to the on the fly, adding chopped herbs, roasted onion or a sprinkle of spices as you go. While homemade is best, there’s a handful of store-bought bone broths that taste great and offer up some fierce competition. Whether homemade or store-bought, the best bone broth is made by slowly simmering bones and joints in water with a splash of vinegar or wine. Those hours of slow simmering at low temperature allows the collagen in connective tissue dissolve into the broth, giving bone broth plenty of protein, while maximizing its flavor through the release of the amino acid glutamine which gives bone broth it’s umami-rich flavor. Adding vegetables, spices, and herbs toward the end of cooking can enhance that flavor, too. Pressure cooking, which is hot, fast and under pressure, can also replicate the slow-cooked flavor of real bone broth and still yield a high amount of gelatin. Many store-bought bone broth brands take short cuts by decreasing cooking time or by using additives. As a result, they produce inferior quality broths, both in flavor and nutrition. What to look for when buying bone broth? There’s dozens of commercially prepared packaged bone broths available at health foods stores and online. While most are dull in flavor or lacking in protein, you can still buy good quality bone broths, as long as you know what to look for. When buying bone broth, you want to find something that’s as close to homemade as possible. They should make it with wholesome, real food ingredients like those you’d find in your own kitchen. They should make it without additives, coloring or flavor enhancers. They should choose grass-fed beef bones, pasture-raised or free-range poultry bones. They should simmer or be pressure cooked long enough to extract plenty of protein and good flavor. Bone broths should simmer long enough, but not too long. To make deeply flavorful broth that’s also rich in protein and other nutrients, you should simmer broths over low heat for an extended period of time. Traditionally, this is a long and slow process, although pressure cooking also creates a flavorful, protein-rich bone broth. This long and slow process allows for the bones and connective tissue to fully release their nutrients, giving you a lusciously rich bone broth that’s full of collagen – a matrix of proteins that supports bone, joint, gut and skin health while while also supporting optimal blood sugar regulation. Since collagen is best extracted by long, slow cooking, look for brands that replicate the process of making a traditional home-cooked bone broth. The bone broth brands that do prepare their broths the traditional way, though long slow cooking, will usually list how long they simmer bones on their website or on their packaging. Bone broths should cook long enough to release plenty of protein, but not so long that they begin to taste dull and overcooked. Simmering bone broths too long can also break down their gelatin, and dramatically increase its glutamine content. Glutamine is the third most abundant amino acid in bone broth. It helps your body build new proteins, and it also supports gut and brain health; however, if you’re particularly sensitive to MSG (most people are not), foods that are very rich in glutamine might exacerbate your symptoms. To get the best flavor and plenty of protein, look for a bone broth company that simmers their chicken broth at least 8 hours and their beef bone broth at least 12 hours. There’s not much benefit to simmering bone broth longer than 24 hours for chicken broth or 72 hours for beef bone broth either in terms of protein extraction or flavor. Bone broths should be made from grass-fed beef bones, pasture-raised or organic free-range chicken and pork bones. Animals that live on pasture offer more nutrient-dense meat, milk and bones. Not only does this influence the flavor of bone broth to a small degree, but it also makes for more nutritious broth, too. While all bone broth, including bone broths made from animals held in feedlots, should be rich in protein, protein is not all that is extracted when making bone broth. Simmering bones for several hours not only extracts protein from their connective tissues, but small amounts of minerals, and, potentially, trace amounts of heavy metals like lead and cadmium (source). Since heavy metals are ever present in our environment, even organic foods can contain very small, trace amounts; however, conventionally produced foods typically have higher amounts of heavy metals like lead and cadmium. While it is not possible to completely avoid their presence, it is possible to minimize it by choosing foods less likely to contain them, and that means choosing organic and grass-fed or pasture-raised when at all possible. Bone broths should have a high protein content. The best bone broths are rich in gelatin, which is extracted from collagen found in the connective tissues of joints and bones. Gelatin is an easy protein to digest, and it supports gut, skin, bone and joint health. Gelatin is also responsible for the silky mouthfeel of bone broths, and it gives them a bouncy, gelled structure once they cool. A high protein content is a sign of good quality bone broth. Since protein increases when bone broth is slowly simmered over several hours, a high protein content in broth indicates that the company that produced it took their time and didn’t cut corners. A high protein content also shows that the company didn’t skimp on the volume of bones they used in relation to water. Using to too few bones produces a weak, dull broth that offers little nutrition compared to its competitors. Look for a bone broth that offers at least 10 grams of protein per 8-ounce (1 cup) serving. What to avoid when buying bone broth? The best bone broth brands replicate not only the traditional, long slow simmer of making broth at home, but they also use the same ingredients you might use at home. That way when you purchase a store-bought bone broth, you’re getting a broth that is as close to homemade as possible. So look for bone broth brands that contain the same ingredients you’d use at home: bones, vegetables, herbs and spices as well as an acidic ingredient like lactic acid (found in yogurt, kefir, whey and fermented vegetables), vinegar or wine. It’s that acidic ingredient that helps release collagen from connective tissue, giving your bone broth plenty of protein and a great gel. Bone broths should be free from fillers and additives such as sugar, hydrolyzed proteins, yeast extract and maltodextrin. To cut corners and to enhance the flavor of their broth, some bone broth brands will add fillers and additives to their broth. You’ll see sugar, hydrolyzed proteins, yeast extract, disodium inosinate, disodium guanylate and maltodextrin on the nutrition labels of cheap brands. When you see these ingredients on a package of bone broth, you know that the manufacturer skimped and cut corners rather than preparing bone broth the way you would at home. They took those short cuts hoping to replicate the flavor of real bone broth without investing in the time, quality or ingredients it takes to make the real thing. Additives, fillers and flavor enhancers are a certain red flag. Broth makers add sugar to their commercially prepared bone broth to enhance its flavor. Sugar is not traditionally added to homemade broths, but some homemade broths have subtle sweet because you’ve tossed in an onion, or some carrots which will sweeten the broth ever so slightly and give it a wonderful, rich flavor. Cheap bone broth brands add sugar to their broths to provide that sweetness without investing in good quality ingredients or better production methods. The addition of sugar also increase the glycemic load of broth. I mean, really, who needs more sugar? Hydrolyzed proteins, yeast extract, disodium inosinate and disodium quanylate are all flavor enhancers added to poor quality, commercial bone broths as well as many bone broth powders. They are present in many packaged foods, and give foods a savory flavor with notes of umami. These additives are high in glutamate, which is related to glutamine an amino acid that is heavily present in bone broth and that gives good broth it’s rich, elusively savory flavor. 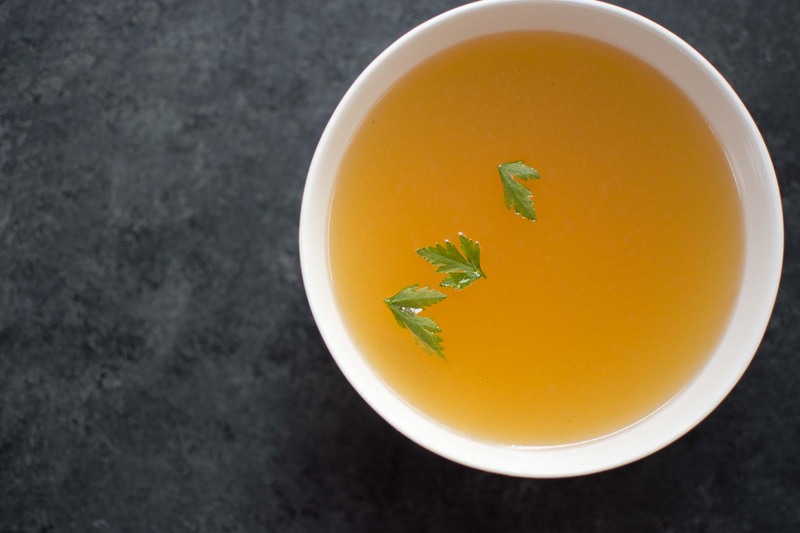 In traditionally prepared bone broths, that high glutamine content and that savory flavor is achieved through long simmering and the slow release of protein from bones and connective tissue. Subpar, commercial bone broths will shortcut the natural development of flavor in their broths by using these common flavor enhancers. For people who are sensitive to MSG, these additives may exacerbate their symptoms. Bone broths that contain additives and flavor enhancers are priced lower and sold more cheaply than broths made the traditional way through slow cooking and good quality, real food ingredients. Remember: you get what you pay for. If you see flavor enhancers and additives when you look at the label on a package of bone broth, give it a miss. You’ll know that that the maker took shortcuts and isn’t delivering anything close to the real thing. What’s the Best Bone Broth Brand? Strapped for time? Just don’t want to make your own? It’s nice to have some good broth on on hand, just in case you need it. You can find bone broths that are almost as good as homemade online. While nothing beats the richness, flavor and good nutrition of a homemade broth, there’s a few brands on the market that use the same techniques and quality of ingredients that you would use at home – without taking shortcuts or using cheap additives and flavor enhancers. Kettle and Fire offers shelf-stable, long-simmered bone broths made from grass-fed beef, free-range chicken and organic vegetables, herbs and spices. It contains no additives, or flavor enhancers, and it achieves its deep flavor and high-protein content the old-fashioned way: through real food ingredients and extended, long, slow simmering. How long does it cook? 10+ hours of chicken bone broth, and 20+ hours for beef bone broth. What’s it made of ? Grass-fed beef bones, free-range chicken bones, with various organic herbs, vegetables and spices listed on the label. How much protein is in it? Chicken bone broth contains 10 grams of protein per serving, while the beef bone broth contains less. How’s it packaged? Shelf-stable tetrapaks. Where can you buy it? Kettle and Fire offers unflavored and flavored bone broths as well as soups made with bone broth. You can purchase it here. Epic Bone Broth is made by slowly simmering bones, vegetables, herbs and spices over an extended period of time, though they don’t disclose how long. Their bone broth offers plenty of protein, and it contains no additives or flavor enhancers, just real food ingredients. Epic focuses heavily on animal welfare, all ruminant animals (beef, bison, lamb etc) are grass-fed with an emphasis placed on planned holistic management, a livestock management technique that has shown to increase ecological diversity on farms and ranches as well as sequester greenhouse gases in the soil. What’s it made of ? Grass-fed beef bones, free-range chicken bones, with various organic herbs, vegetables, fruits and spices listed on the label. How much protein is in it? Their broths contain about 10 grams protein per 1-cup serving. How’s it packaged? Shelf-stable glass jars. Where can you buy it? Epic offers four flavor-infused bone broths, and you can buy them online here. Bare Bones Broth simmers the bones of pasture-raised chickens and grass-fed beef about 24 hours to produce a beautifully flavorful, protein-rich bone broth. They use only real food ingredients in their bone broths, and never adds flavor enhancers or other additives. Bare Bones Broth offers several classic bone broths, which are excellent for sipping or to use in cooking, as well as flavored sipping broths. How long does it cook? Bare Bones Broth cooks their broth about 24 hours. What’s it made of ? Grass-fed beef bones, pasture-raised poultry bones as well as organic vegetables, spices and herbs. How’s it packaged? Shelf-stable packages with convenient pour spouts. Where can you buy it? You can order Bare Bones Broth here. Protein-rich bone broth is a great addition to your kitchen game whether you make it from scratch at home, or buy it from a good source. Bone broth is wonderfully rich and savory, easy on the stomach, soothing to the throat and all that gelatin is great for your skin. Want to make your own broth? 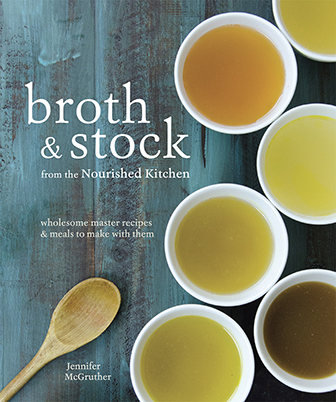 Broth and Stock is an easy cookbook that gives you excellent recipes for making a variety of homemade bone broths. You can order it online here. Don’t want to make bone broth? Kettle and Fire offers shelf-stable, slow-simmered grass-fed beef and free-range chicken bone broth that’s almost as good as homemade. Order it here. What are the benefits of bone broth? Check out the skinny on the benefits of bone broth here. Need some recipes? This roasted turkey bone broth is super simple to make, and you might also try this chicken bone broth and this beef bone broth. Surprise! Bone broth isn’t rich in minerals! It’s not and here’s the skinny on bone broth and minerals. And if you want to increase your minerals, try this mineral-rich bone broth elixir that’s loaded with veggies. Not getting any gelatin in your broth? Here’s why your bone broth won’t gel. BUTTER! i purchase kerrygold,plugra,strauss(out of loyalty and to support their position on the GMO conversation). sometimes anchor. when pressed,will purchase organic valley. Add in Rumano Butter if testing. I have found it very rich yellow with great flavor. Yes, please do a butter testing! It would be interesting to see how nutrition data varies for the projects you’re taste testing as well. I really like Chef Lance, too! Super personable and really committed to quality ingredients for his broth. I’d love to see you taste butter. I often do my own taste tests, which are fun, but I’d enjoy you putting “professionals” up to the task. Butter is an item that gets eaten in large quantities in our house! Thanks for all you do and all that you share. I’d go for butter next go round of testing. I’d be particularly interested to see how the pastures or summer butters fare (I believe organic valley has one that’s June-August), and how domestic vs international butters compare. I also was surprised at how many butters include “natural flavors” in their ingredients– including one butter from a small-scale local farm near me! This was a very good, helpful post! It will be a resource for me when I am pressed for time and/or low on my stock of purchased local farm chickens and cannot make my own bone broth. Thank you for this. It was unfair to include that last brand. It’s not even sold as a bone broth. Of course it isn’t going to rank anywhere on the scale. That’s like comparing Campbells soup to an artisan soup in a taste competition. Thanks so much for your thoughts; however, we decided to include it because it is an organic chicken broth that is readily accessible in almost any grocery store anywhere in the US which cannot be said for any of the other broths. Jenny, Pacific is now selling bone broth as well as bone stock. I wonder how these would rate. Would you consider tasting them and letting us know? I would definitely, if I could get my hands on it. Haven’t tried these others aside from my own but the new Pacific bone broth isn’t bad in a pinch. I don’t care for their traditional chicken broth. Actually it is sold as bone broth. I have and that is what the label says. Linda, they do make a bone broth, but Jenny tested their chicken broth…two different products. Since you have tried their bone broth, could you share your impressions? Hi, enjoyed this article but the link “the reduction method described here” takes me to this page: https://nourishedkitchen.com/how-to-store-bone-broth/ and I didn’t see a recipe here. I’d love to read about the “reduction method for making bone broth” as I’ve made it a number of times. Thanks! The reduction method for storing (not making) broth is located in that page. Id love to see a butter test, specifically grass fed vs others and if nutritionally there is any noteworthy benefit. Thanks. Lacto-fermented sauerkraut! If so, please taste Thirty Acre Farm from Maine. The vegetables are organic and mostly locally grown and their traditional ferments are off the charts!!! Test sauerkraut! But I think butter would be a good one as well. Test whatever you want Jenny. We eat it all. I’ve been cooking a long time and love you and all you post. The chicken post was fantastic especially since my bone broth never turns out the same. Thank you. I love butter and would like that tested too. However I can’t have dairy so what is the best alternative butter, sour cream and cream cheese? How about testing plain yogurt? Great post. We are holding a Valentine dinner class and bone broth is the soup and then a class on bone broths the end of Feb. great info and I’ll plug for your cookbook which I own on kindle and hard copy,too! Great article! I recently made my own from organic bison bones! My sister says the roasted chicken is best but the bison bones have the largest bone marrow content. I agree with the suggestions for butter & sauerkraut, my current faves are Organic Pastures raw butter & Farmhouse Culture Kraut. Their butter is sooo expensive but good & fortunately, Costco now carries the larger bags of FC Kraut at a great price. Also, both are local here in CA…woohoo! Please include both in your testing…TY! I would like to see beef broth tested! Butter would be a good testing subject as there are some national brands – although local ones probably predominate. Here in San Diego, we bring in raw Amish butter in the spring through the fall to really amp up the natural vitamins. Test sauerkraut. And how long can you keep it in the fridge? Hey Jenny, great comparision. I was curious about your InstantPot cook time of 4 1/2 hours. Have you tried shorter? That seems really long cook time for a pressure cooker. The most I do with my Kuhn Rikon is 60-90 mins. I realize the InstantPot has lower psi. Butter and sauerkraut! Wondering if Kerrygold is the best. Thanks for the hints on broth storage. Now I reduce it and put it in ice cube trays. Pop one in a little mug, add boiling water and my 2 year old granddaughter devours it! Thank you for all you do! Taste Butter. I currently buy Kerry gold. I have been making huge batches of bone broth for the last 4 months. I use 16# bones to 3-4 gal water & celery, carrots, onions, ginger, eggshells, Parsely and at the end, sea salt. It is super yummy but has no gelatin in it. I mostly use chicken backs to make it. I also cook it for 24 hours. How do you get so much gelatin from yours? I get lots of good gelatin using chicken feet. Add at least 4…the more, the better…in with all the bones. i’m curious about the best in each category that were discarded along with the bottom in each catefpgory. Please tell us the broths that rated the best in each category. Thanks! Hi Julie – what that means is that we discarded the best and worst individual score in each category for each broth which prevents skewing the results in the event that one judge ranks a broth 10, and everyone else ranks it a 2. If we kept high/low scores a broth that the majority of people love might rank lower than a broth most people only kinda like. You have perked my interest in the InstantPot. Maybe I’ve missed something over the years about making bone broth, but I have put my bones in with some apple cider vinegar in the crock pot on high til it lightly boils, then turn it down to warm and cook for a day or so…sometimes a few days. I was under the impression that you get more gelatin if you have it at a low temp for a loooonnnng time. So, how does it work to use the InstantPot at a high temp/high pressure for 4 1/2 hours?? A vote for sauerkraut. Here in Baltimore, we’re graced with the delectable goodness of HEX Ferments. Thanks for sharing your research! Please test sauerkraut. I buy Bubbies brand and would love to know of other good brands. Butter, please! But please include Kroger grocery store organic butter. I don’t know if it even qualifies to compare, but I live in a remote area and it is usually either this, Plugra or Kerry Gold. I have always wanted a nutritional comparison of these. LOVED this post, thank you so much, great information, and another reason to make the splurge on that Instant Pot! I am enjoying some homemade bone broth right now for lunch! I try to make a fresh batch every Sunday with a chicken that I roast for dinner. I make it in my old crockpot that has a true low setting and I keep it for the whole week, replenishing the broth that I use with fresh water. I use the whole chicken carcass, including all of the fat and skin, one medium quartered onion, a little celery, including the leaves and a heaping tablespoon of black peppercorns. It is so rich and delicious and has made lunch a pleasure for me. It’s also great as a before bed treat. I freeze the filtered broth to use as needed and also for the summer months when it’s too hot to keep the crockpot on all week. Thank you Jenny! I LOVE your blog! Sauerkraut please. I enjoyed your post on homemade sauerkraut enough that I have a batch making now. With spring coming, I am always tinkering with green tomato relish ideas. I always have lots of tomatoes and have made a few batches the last couple of years. Any experience with these type things? So from your survey, the best scoring broths had fewer ingredients, and the worse scoring broths had more. But we can’t say if the additional ingredients/vegetables/herbs made the commercial broths flavouring better or worse– for all we know, those broths may have tasted even blander/fishier/metallic/worse if these additional ingredients were absent, correct? I be interested in doing another broth trial with broths from several people who make it at home, with each person making two broths– one with additional flavours, and one without. Butter! And please include Rumiano in the test. We get it by the case from Azure Standard and would like to see how it stacks up! Butter would be another great taste test. You can search the site by using the search box in the right-hand sidebar. When did you start using a pressure cooker? I thought you always promoted slow cooking in a dutch oven. Did I miss something? I started using a pressure cooker last spring, and fell absolutely in love with it. I gave away the slowcooker as a result. I started using it after looking into pressure cooking in general, as well as its effects on nutrients. I think I was wrong in my initial, outright dismissal of it. I really wished Au Bon Broth Bone Broth would have been able to send in a sample of it’s bone broth. You would have been very pleasantly surprised. Can it be included in next taste samplings? Do you go through a few cycles on the instapot? I can’t program mine for more than 2 hours…roast carcass and feet in the pot now! I would love to see what your judges decide on the Yogurt. There are a lot of brands in the USA that are not authentic yogurts. The more ingredients, the farther from the truth. So, now I know which bone broth is best. Just one question — how much and how often should I eat to gain the benefits? Hi Wendy! I think it’s best to look at broth as a nourishing food, not a prescription. Just as you wouldn’t give yourself a set amount of kale to eat, it’s best just to enjoy broth as a nourishing addition to your meals, enjoying it as often as suits you along with plenty of other wholesome foods. I’m curious, isn’t it dangerous to pressure cook for 4 1/2 hours ? I use an electric pressure cooker, and don’t cook it continuously that long. It cooks in 90 minute cycles, so when it stops, we start it again. I wouldn’t keep a pressure cooker on the stove that long. I haven’t gotten a chance to try all of these, but I definitely will purchase a few of these after reading these great reviews. Though I have to say, there is nothing like making your own bone broth. I love the smell, the taste, and the sense of accomplishment. Also, as you said, where the chickens are from and how they were raised is important to the overall flavor. When you make your own broth, you have a little bit more control over the chicken you use. I thought it was interesting that the less spices, the more people liked the broth. I’ve always thought that people should be allowed to season to their liking, and I guess that’s true with bone broth too! Can you please divulge where you get your chickens with only supplemented sprouted grains and whey? I would sooooo appreciate knowing!! Thank you! I love this! I agree about the Pacifica broth. I tried using it in between the time I stopped using regular, non-organic broth and making my own. It always had a slightly off flavor. Would love to see an updated/new comparison of the available bone broths. So much has changed since you first published this. It looks like you just got Pacific brand Chicken Broth… and not Bone Broth. Yes, both are pretty awful. I enjoyed the article on “What’s the best bone broth”. However, I do feel the inclusion of Pacific’s organic free range chicken broth was not helpful. If you were unable to obtain their “chicken bone broth” there should not have been a “chicken broth” substitute included in your survey of “bone broth” products. I would like to know how the Pacific brand bone broth compared to the other bone broth brands. Your audience is left with a rating of the Pacific chicken broth product that was not good and might lead one to conclude that the Pacific bone broth might not be good also. That is unfortunate. Hopefully, there will be a future opportunity to rate the Pacific bone broth with other bone broth brands. At egg pressure do you cook the chicken bones in the instant pot for stock? Do you add any other ingredients? WHat do you think of OSSOGOOD bone broth? I haven’t tried it, so I have no real opinion to share. But if it meets the qualifications I’ve listed above, and you like the flavor, then it would likely be a good fit for you.